You'll be £12.99 closer to your next £10.00 credit when you purchase Hitler's Boy Soldiers. What's this? Founded in 1922, the Hitler Youth movement, or Hitlerjugend, was comprised of male youths aged 14 – 18 and, by December 1936, membership stood at over 5,000,000. During the Second World War its role evolved from assisting with the postal, train and fire services into full war fighting. Recruits went into units such as the elite 12th SS Panzer-Division ‘Hitlerjugend’ and, in this brilliantly illustrated book, we see graphic images of this Waffen-SS force in action both on the Eastern and Western fronts. Even as the Nazi cause faced inevitable defeat these units fought with disturbing bravery and, after surrender in May 1945, fanatical elements carried out guerrilla actions in the Bavarian and Austrian mountains. 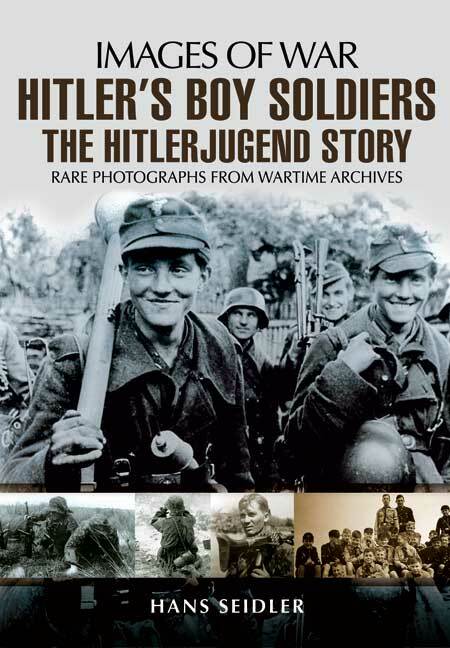 Using rare and often unseen contemporary images, this latest work in the increasingly popular Images of War series traces the development of the Hitlerjugend into a formidable fighting formation and gives the reader a better understanding of this legendary but distasteful Nazi organisation. Seidler's photograph captions are informative, as are his chapter introductions, providing interesting background information and context. Whether you want to learn about the Hitlerjugend, have an interest in the Second World War or are merely interested in wartime period photographs, then this book will certainly prove interesting. Another great release from Pen and Sword in their Images of War series. The book tells the compelling story of the rise and fall off this well known division during the years before and during WWII. One can only imagine how the Allied forces felt when they met this formidable fighting formation. Rare and often unseen black and white images are used like in any other release in this Images of War series. How Nazi boy soldiers fought advancing Allied troops in the final days of the Second World War is described in a new book about the Hitlerjugend. Founded in 1922, the Nazi youth movement boasted five million members by the time war broke out in September 1939. The book, Hitler’s Boy Soldiers (Pen and Sword:£12.99), tells how these German youngsters, after the fall of Berlin, fled to the mountains of Bavaria and Austria in the hope of continuing resistance as partisans. The Nazi youths followed orders and ambushed Allied troops using the trick of stringing wires across mountain roads in the hope of decapitating the victorious advancing soldiers. In the winding mountain roads these fanatical youths, some dress as civilians, played chicken being dead in the roadway as American infantry approaches, only to open fire on them from the rear once they had passed.” Says the author of this lavishly illustrated 112-page book. This Alpine resistance continues for six months after the Germans realised in May 1945 the war was lost. The book also describes how the German youths bravely fought the Russians as they smashed their way to Berlin with the advancing troops having at times to use flamethrowers to overcome the stiff resistance. Using rare, mostly unpublished images, author Hans Seidler traces the development of the Htlerjugend into tough fighting formations. One caption to an action picture explains that with so many youngsters in fighting units, their officers replaced the usual cigarette ration with sweets until the boys were old enough to smoke. This paramilitary organisation of the Nazi Party was the second oldest group and consisted of male youths ages 14 to 18, each trained in Nazi ideology and the art of Warfare. One cannot help but wonder what happened to these lads, at least those who survived the bloodshed, after the guns ceased firing. "A part of the "Images of War" series, this book draws on rare photographs to describe the history of the Hitler Youth movement. It begins with their pre-war indoctrination, with parades and propaganda images, and then their gradual militarisation, with photographs of training exercises and their introduction to armaments. This enterprise culminated in the founding of the 12th SS Panzer Division "Hitlerjugend", which despite being derided as the "Baby Division" by the Allies, was to prove itself in Normandy, and in all subsequent engagements, as an extremely capable unit with a fanatical determination which bordered on the reckless. Many photographs follow the progress of this Division, as well as other members of the Hitler Youth serving on both the Western and Eastern Fronts. In the final pages, the focus shifts towards the desperate defence of Germany, with a series of increasingly young faces being pressed into service, some of whom appear pleased when they were taken prisoner, but others displayed an unswerving loyalty to Nazi ideology and continued to fight even after the war had ended."